A wide range of musical styles and instruments will bring DeVos Hall in Grand Rapids alive when Hope College presents its 27th annual Musical Showcase concert on Monday, March 2, at 8 p.m. The program will open with sophomore violinist Madalyn Navis of Cedar Grove, Wisconsin, accompanied by pianist Jennifer Wolfe, playing “Elite Syncopations,” by Scott Joplin (arranged by Itzhak Perlman). The Woodwind Quartet will perform “Charlie is My Darling,” by Gordon Jacob. Senior soprano Rebecca Flinker of Leeds, Massachusetts, accompanied by pianist Janice Faber, will perform Jason Robert Brown’s “I Am Not Afraid of Anything.” Sophomore organist David Heinze of Kentwood will perform “Final (Symphony No. II),” by Charles Marie Widor. The Small Jazz Ensemble (BFGs) will perform “Smile,” by Charlie Chaplin. The Women’s Chamber Choir, accompanied by pianist Lannette Zylman-TenHave, will perform “African Lullaby.” “Quartet (2nd Movement),” by Alexander Glazunov, will be performed by the Saxophone Quartet. Sophomore violinist Manna Shintani of Tokyo, Japan, accompanied by pianist James Schippers, will perform “March (Love for Three Oranges),” by Sergei Prokoviev. Tesori and Scanlan’s “The Girl in 14 G” will be performed by junior soprano Kira Alsum of Grand Rapids, accompanied by pianist Janice Faber. 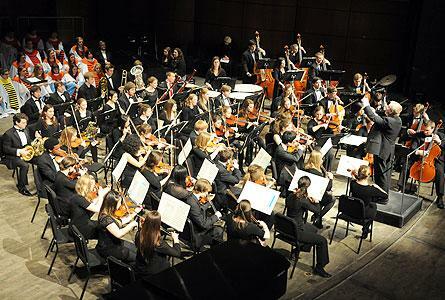 The Wind Ensemble will perform Nicolai Rimsky-Korsakov’s “Allegro (Symphony No. 2).” “Fantasie-Impromptu (Op.66),” by Frederic Chopin, will be performed by junior pianist Danny Winters of Oak Park, Illinois. The Chapel Choir will perform “Rytmus,” by Ivan Hrusovsky. “String Quartet No. 2 (Movement 1),” by Sergei Prokoviev, will be performed by the String Quartet. The Flute Choir will perform “Fanfare 20,” by James Christensen. A Saxophone Duo, accompanied by pianist Jennifer Wolfe, will perform “Duo Concertante,” by Jean-Baptiste Singelee. “Dich teure Halle,” by Richard Wagner, will be performed by senior mezzo soprano Danielle Meyer of Dearborn, accompanied by pianist James Schippers. The Jazz Arts Collective will perform “Reflexoes,” by junior Colin Rensch of Kalamazoo. Senior violinist Eve Panning of Holland, accompanied by pianist Jennifer Wolfe, will perform “Tango por una Cabeza,” by Carlos Gardel (arranged by John Williams). Junior organist John Deppe of Marshall will perform Jean Langlais’ “Hymne d’Action de Grace.” “Flower Duet (Lakme),” by Leo Delibes, will be performed by senior soprano Rebecca Flinker of Leeds, Massachusetts, and junior mezzo soprano Rosemary Walsh of Evanston, Illinois, accompanied by pianist Janis Faber. Tickets for Musical Showcase are $10 each and can be purchased at the ticket office in the Events and Conferences Office located downtown in the Anderson-Werkman Financial Center at 100 E. Eighth St. The Events and Conferences Office is open weekdays from 10 a.m. to 5 p.m. and can be called at (616) 395-7890. Tickets are also available online at hope.edu/tickets. In addition, tickets may be ordered by phone through Ticketmaster by calling (616) 456-3333 or visiting ticketmaster.com. A service fee is added to the cost of each ticket purchased this way.